But I like to be scared on occasion. I like my spine to tingle. I like that feeling to come from a book because I can set the book aside, go out on the deck and breathe in reality, away from ghosts and axe murderers and devils. The more "real" the potential for the ghost to be, the more spine tingling the reading experience. Today's theme is difficult. Walk into any mega bookstore (although not Borders, sadly) and the shelves and stacks are lined with books, one and two copies of tomes by authors who, if this was a record, would have "a medley of their hit" on the shelf in front of you. Type a title into Barnes and Nobel or Amazon and chances are very good, an image will appear and you will still be able to buy a fresh copy of whatever you're looking for. I read through my book journal for something, anything, I could use as the book for this topic. "That's still in print. That, too. I think that one is, as well." 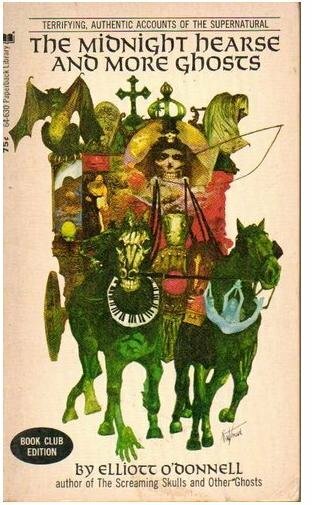 Then, I stumbled upon a listing for The Screaming Skull and Other Ghosts, the book that's referenced under the author's name in the illustration. "I wonder if the one I have is still in print," I thought. No, no it is not. I bought The Midnight Hearse from a school book fair back in the early 1970's. My copy has the same illustration as you see in the photo. I didn't get around to reading it until the summer. After doing my morning chores, I curled up on my bed, cracked open the book and started reading. I don't think, prior to this book, I'd had any experience with "true" tales of hauntings. Ghosts were limited to "Caspar" on Saturday morning cartoons. O'Donnell is a masterful story teller and it is thought that most of his stories benefited from his literaray prowess. But that doesn't make them any less scary. I remember being so scared by what I was reading that I had to stop reading at 2 in the afternoon. The opening story is about a bunch of friends at a college in England who decided to play cards one night. One of the friends was on a lucky streak, winning hand after hand. His friends decided, after several hours of this, they needed to take a break but the winner didn't want to. He said he'd continue playing cards even if the only person he played with was the devil. The friends laughed him off and went for a walk. As they left the building, one of them commented on the tall man in black who was walking toward the dorm where their friend was. They returned to the dorm about 30 minutes later to see an old fashioned hearse parked alongside the building. As they approached, a man left the building by way of their friend's first floor window. He was carrying a casket on his back. He mounted the horse-drawn hearse and the vehicle moved away. One of the friends suddenly realized there was no sound coming from the horse's hooves on the pavement of the drive. The hearse itself seemed to melt into the shadows of the dorm. They ran to their friend's room but the door was locked from the inside. They ran to the window and saw him lying on the floor. They couldn't get in because the window was locked from the inside. How had that guy been able to leave via the window if it was locked? They had to break a window pane to get in. Of course, the friend was dead. He had been playing cards with someone because there were two hands on the table. Whomever he had been playing with had won all of their friend's chips. What really got them was the frozen look on their friend's face of abject terror. There are some 30+ stories in this vein in this book. O'Donnell's books are not in print anymore. If you want to read them, a library or a used bookstore is the place to find them. I didn't think The Screaming Skull was nearly as good as The Midnight Hearse. Embroidered tales or not, they make for some terror-ific reading if you are so inclined.